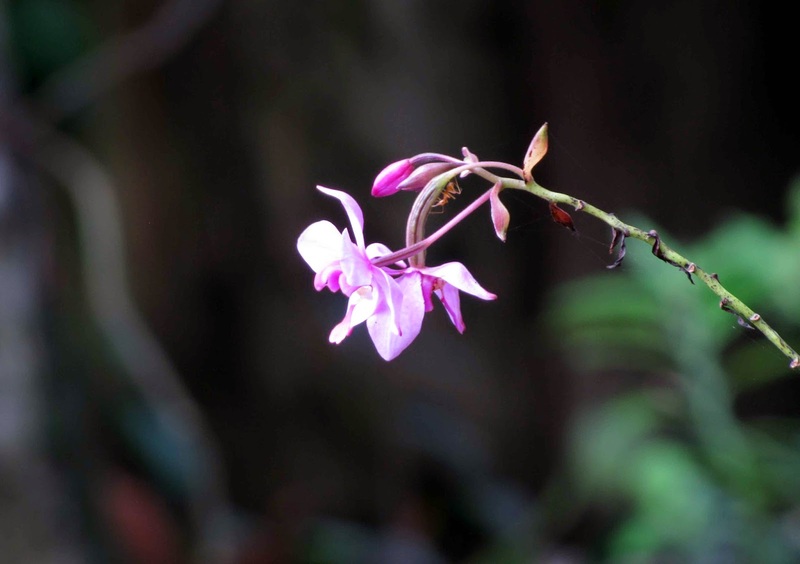 Liked the way this single stalk of Orchid stood out, braving the rain and the strong breeze. They are good as a substitute for tamarind or tomato in an emergency. 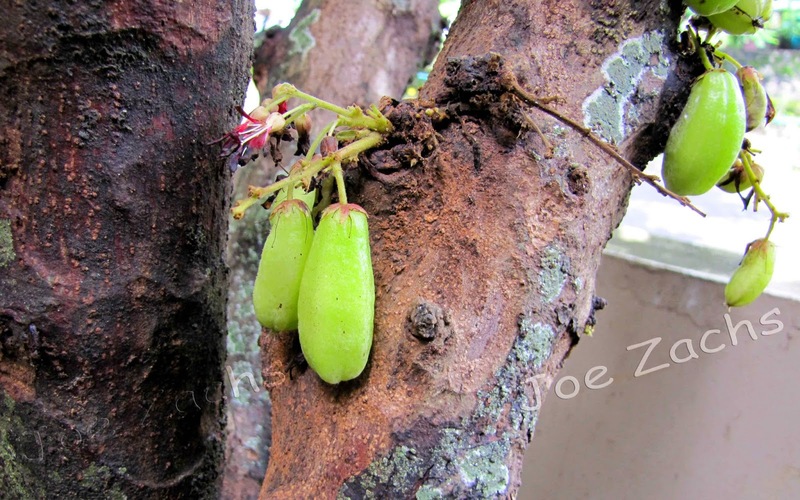 They are easy to pluck as they grow low – on the trunk of the tree. Another view from the window is this big bunch of banana. A close look at this rope showed some busy ants. When I followed their trail, I found that they were building their home in one of the low slung trees. We humans can learn a few things by observing their team work. 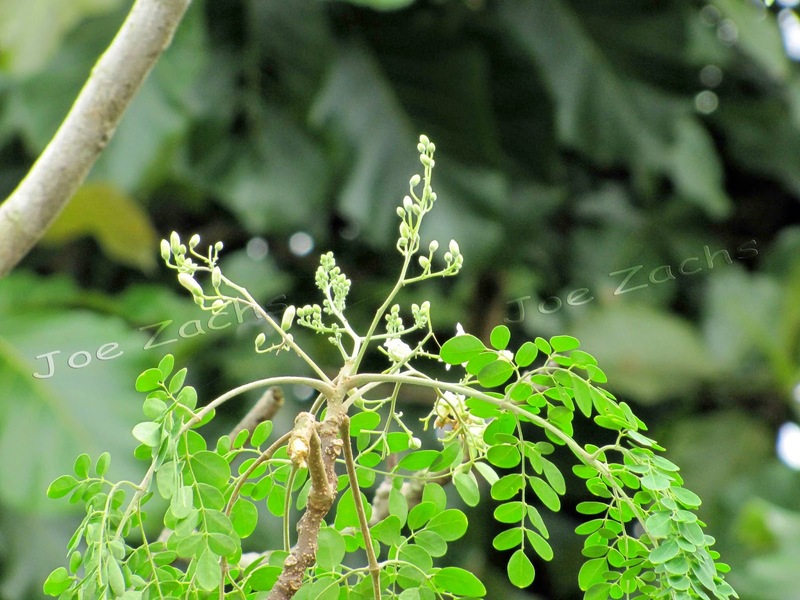 I spied these flowers on the drumstick tree. Always liked the side dish that was prepared from the drumstick flower. 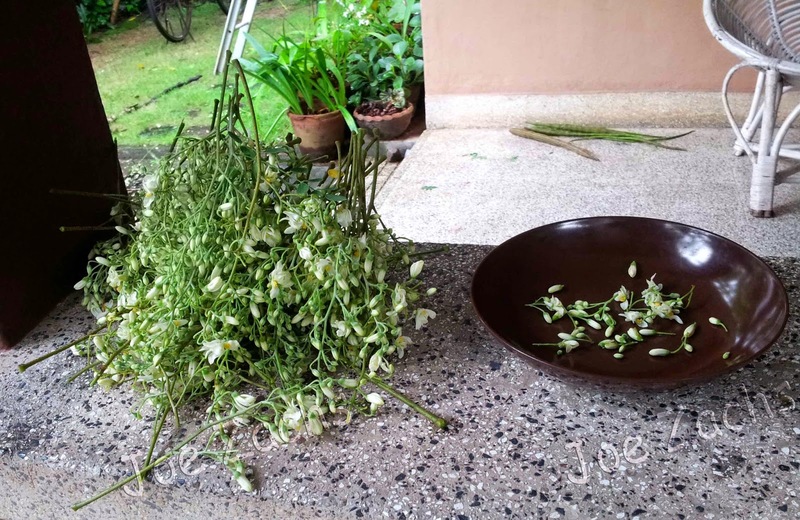 So I collected as much as I could, and carefully removed the flowers and segregated them. These were properly washed and soaked. After draining the water they were sauted on slow fire. Added some grated coconut and further sauted them. The end result was really sumptuous. 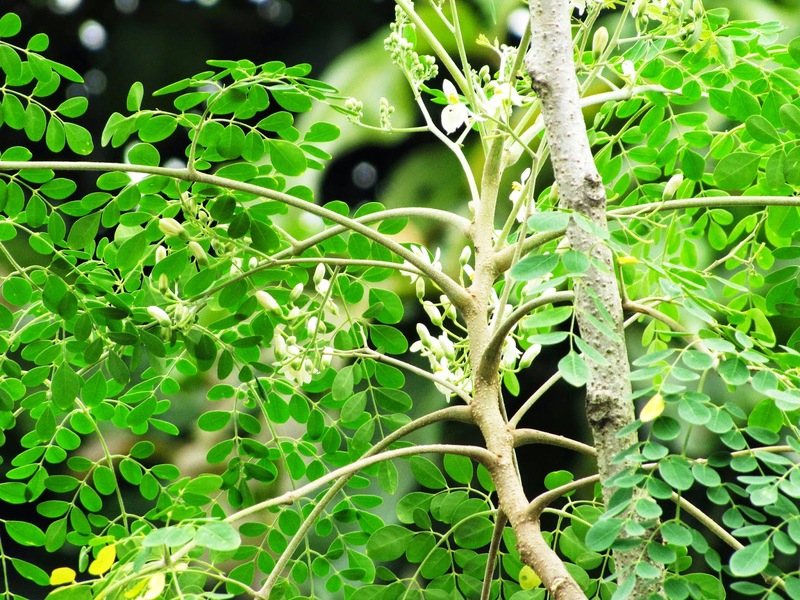 Drumstick flowers prevent frequent infection of the throat, chest and the skin. Next post - some more on the Kerala trip. Thanks for directing me here. When we go to Kerala also we end up doing the same thing - observe the world outside from our window and I must say that we are never ever bored. I can imagine how you would have felt looking at these life forms from your lens. I was wondering why the post was titled, "drumstick flower" and only when I reached the end of the post, my curiosity was answered. Looking forward to the rest of the pictures as well. Lovely snaps. as always. Hope to visit Kerala one day. My ma used to make a dish of drumsticks flowers with grated coconut ... been ages since I tasted it last. Absolutely love that photograph of the ant. Haddock hey loved all the pics...especially the ant one but i wonder if that aunt ( the one that prepared bisebele) or you could pass the drumstick flower recipe too...looks exotic...sounds interesting. Remember eating it too and i know the net is always there but i want it...from u..ur way...the bisi bele way. That puli looks green...does it assume a dark color later? Is it the same thing as Kodampuli??? Do let me know because what i got a whole jar of it to put in my fish curry to get that flavor was dark in color. Which not only added the required amount of sourness to the curry but also imparted a particular flavor,smell and color to the meen curry. Thanks Joe, lovely pics. Enjoyed reading. I take it as my privilege not to thank you every time. Your blogs are stupendous and along with those equally beautifful snaps. I AM THANKFUL TO YOU FOR HAVING KEPT ME IN YOUR MAILING LIST. I ALWAYS THANK YOU FOR EACH OF YOU BLOG..
Oh no Shivani, this does not turn dark. The kodampulli is something different and is used by mostly by south Indians especially for Fish curry. 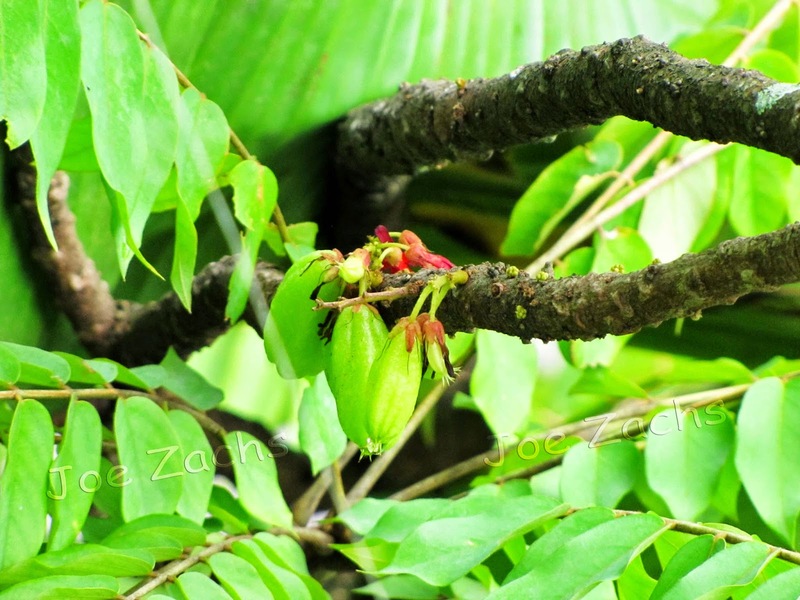 The other one is the Valampuli (Imli - tamarind) that is used in Sambhar etc. 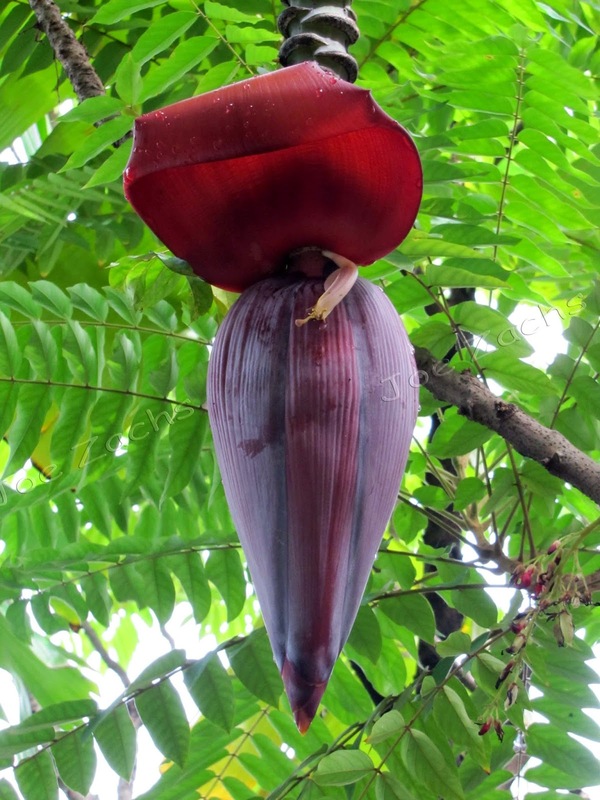 You have beautiful and interesting plants there. Very interesting process, from start to finish! Everything here, except the bananas, is rather exotic as far as my experience goes...I'd sure give that final product a try, though. Thanks for your comments! Very interesting post with so nice pictures and informations !!! Also thank you for your kind comment in my painting blog. Very nice to meet you and see you again !!! I loved your interesting post about the plants that are edible and how to prepare them. 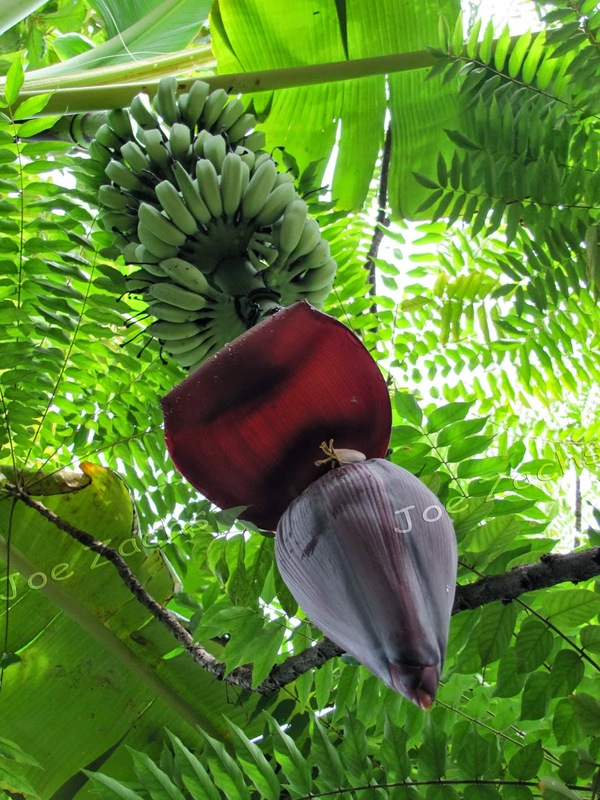 The banana hearts, so interesting! Thanks for sharing your world. I want to learn more. Wonderful photos, Joe. I enjoyed seeing these. These pictures are making me hungry and nostalgic at the same time :) Especially the 'throran' and puli! I am hungry..and I also feel like going for a walk. and you are right we humans should take a lesson not just from ants but from all animals , i think we need to ..
Kerala is always a beauty by Nature and Taste. You have captured it wonderfully . Very interesting. Cheers to Kerala and Joe. Beautiful pics. Mouth-watering... Particularly the drumstick flower bowl on the grass. I remember having drumstick flower thoran only once in my entire life. What a superb dish it was! Thanks for the comment you left on my blog. 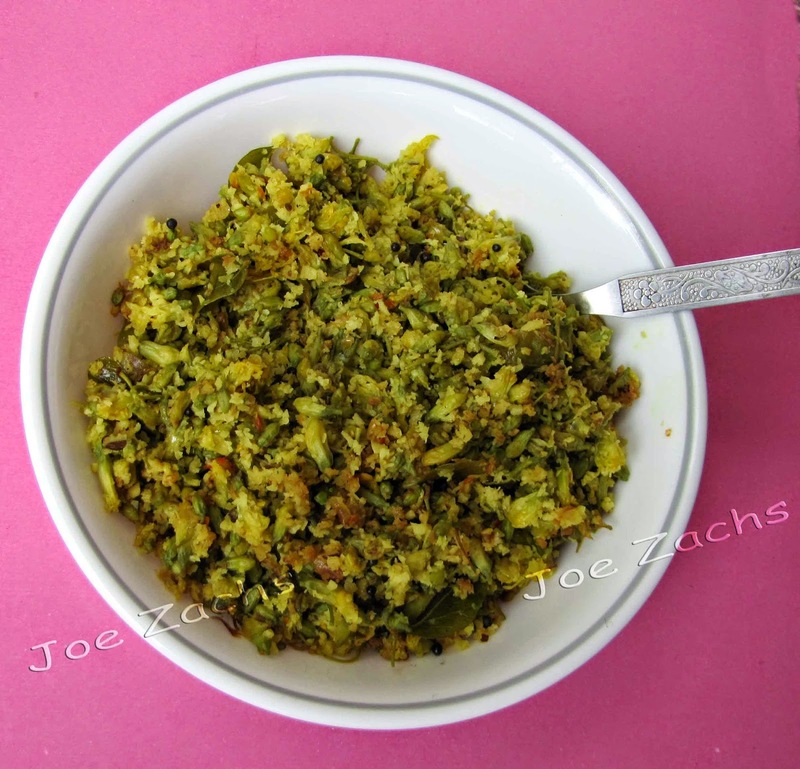 The cumin seeds had to be knife-grinded in the absence of mortar and pestle. 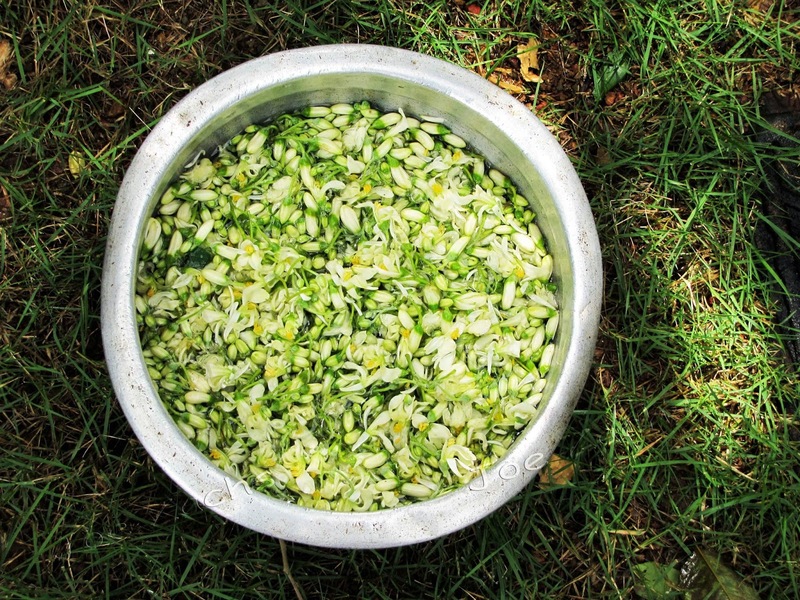 I'd never heard of Drumstick flower, it sounds divine! What a treat it was to read this...beautiful images and description. I will try this as I am die hard 'drumstick lover'! Lovely pictures taken from around your home - all the green is so refreshing. Really beautiful and interesting detailed photos and text. I learned a lot by reading your blog. 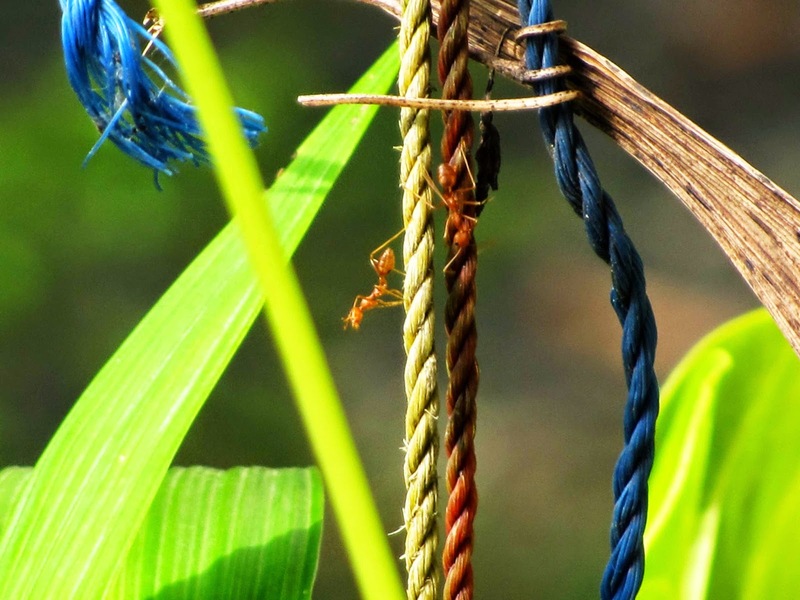 Here's to the collaboration of humans and ants! I've voted for you in the Big Blog Exchange.